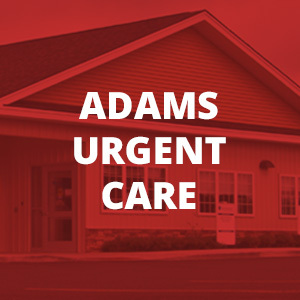 Our premier Urgent Care Locations in Watertown and Adams provide quick, friendly, and professional care seven days a week. Urgent Care walk-ins are welcome – no appointment needed! Plus, we’re a Nationally Certified Clinic. Our Urgent Care Staff treats everything from colds and coughs to aches and sprains. Illnesses, allergies, and sports injuries are all treated here. We also provide flu shot immunization services. Both Urgent Care locations even have on-site x-rays and lab services, in association with Samaritan Medical Center! Click here to find the Urgent Care closest to you. Watertown and Adams Urgent Care not only care for our community but at the request of the Medical Programs we precept future Physician Assistants from Upstate Medical School and Lemoyne’s Medical program. We also do onsite training for the local nursing programs. These programs have recognized the quality of care and experience of our staff to entrust their students. Get urgent care for colds, coughing, sore throat, allergies, or sinus pressure, and more. Treatment for minor aches, pains, and sprains including cuts, fractures, and workplace injuries. We treat most minor illnesses, and with availability seven days a week, you won’t wait long. Quick access for treatment for minor sports injuries including sprains, fractures, and minor eye injuries. Allergies are the worst. Find relief with Urgent Care allergy treatment including allergy shots. Quick and convenient on site X-Ray. X-Ray services are available at our Watertown Urgent Care location. Get your Flu Shot Immunization at either of our two convenient locations, no appointment necessary. Our partnership with the Samaritan Medical Center means gives you easy access to on-site labs. 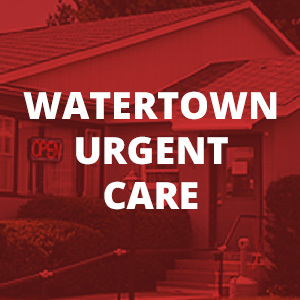 Watertown Urgent Care and Adams Urgent Care provide affordable, convenient and comfortable care when you need it most. Serving Jefferson County, Lewis County, St. Lawrence County, and Oswego County. ©Copyright 2017 Watertown Urgent Care. All Rights Reserved.